Love delicious yeast rolls, but forgot to start the bread machine 3 hours ago? 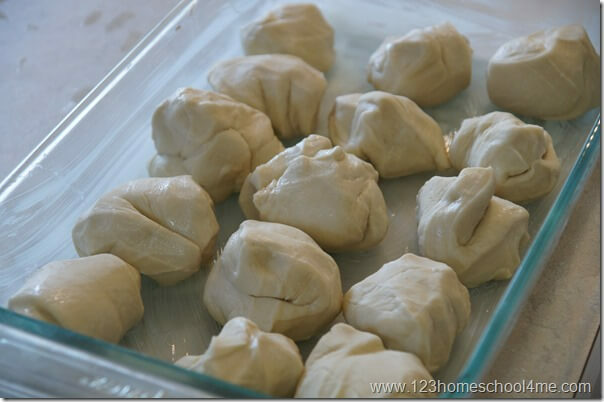 No problem with this easy-to-make one hour yeast rolls recipe. And oh, they are so good! My family loves rolls! Whose doesn’t? But I often forget to prepare them ahead of time. 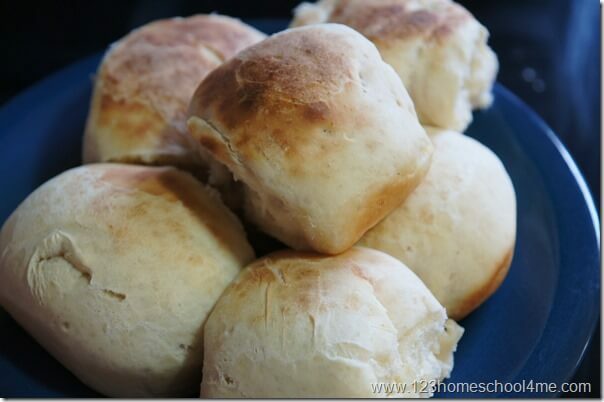 No worries with this fantastic recipe for yeast rolls. 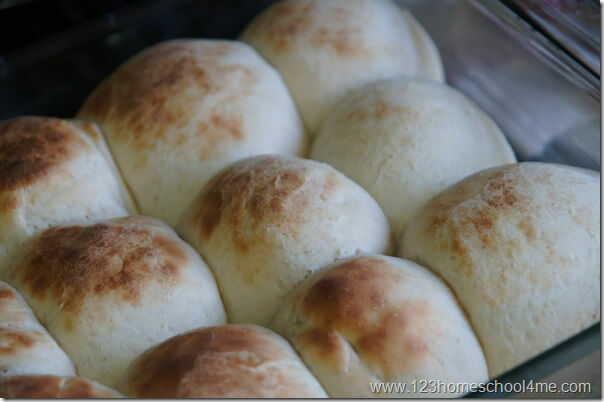 It will leave you with big, soft, flavorful rolls in just 1 hour! Plus they taste just as good as the ones that take all day to prepare! 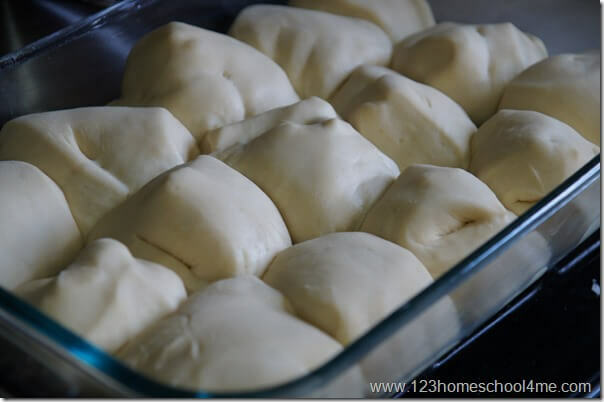 I’ve tried dozens of variations, but these Quick Yeast Rolls are easy to make, quick, and delicious! Start off my putting milk, water, and butter in a microwave safe bowl and microwaving 1 minutes and 22 seconds; set on counter to cool slightly. 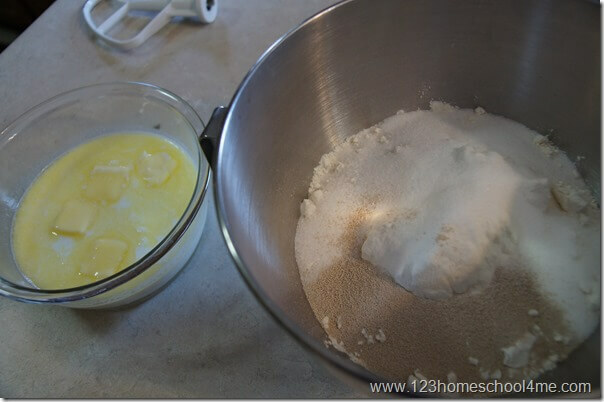 Measure flour, sugar, yeast, and salt in a mixing bowl. 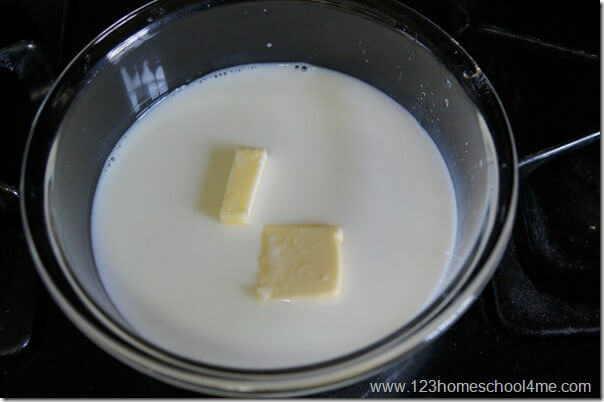 Add warm milk to dry ingredients. 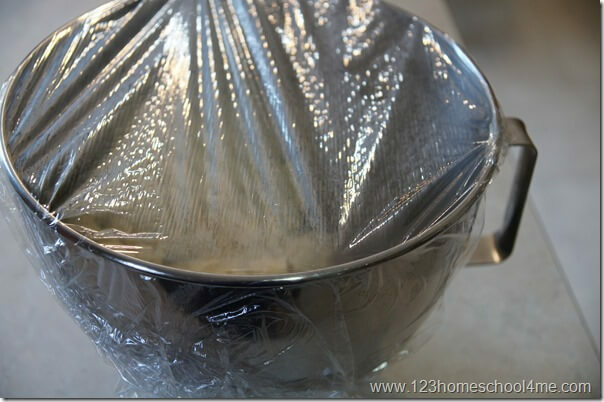 Cover with plastic wrap to rest for 5 minutes. Meanwhile generously butter a 9×13 pan. Put rolls in buttered 9×13 pan. You will have 5 columns and 3 rows. Put pan in 180 F oven to rise for 30 minutes. Turn oven off and DO NOT OPEN THE DOOR while they rise. Then pull them out and they will look like this. Preheat oven to 375 F and put rolls back in the oven to cook for 12-15 minutes. I LOVE that in under an hour I can whip up these easy and mouth-watering delicious rolls to go with dinner! My kids just LOVE these! Love delicious yeast rolls, but forgot to start the bread machine 3 hours ago? No problem with this easy-to-make, one hour yeast rolls recipe. And oh, they are so good! Preheat oven to 180 F. Combine water, milk and butter in microwave safe dish and cook for 1 min 22 seconds; set aside to cool slightly. 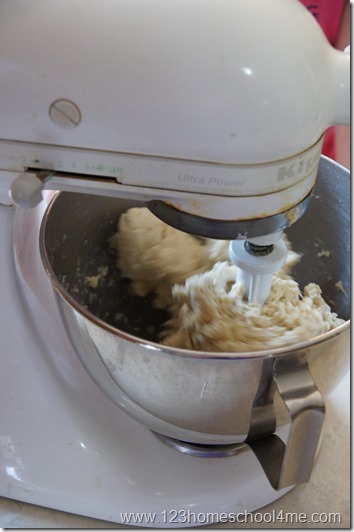 Combine flour, sugar, yeast, and salt in a mixing bowl; add set aside wet ingredients and using a dough hook continue to mix on medium for 3-4 minutes to knead the dough. Cover and allow to sit for 5 minutes to rest. Meanwhile generously butter a 9x13 pan. 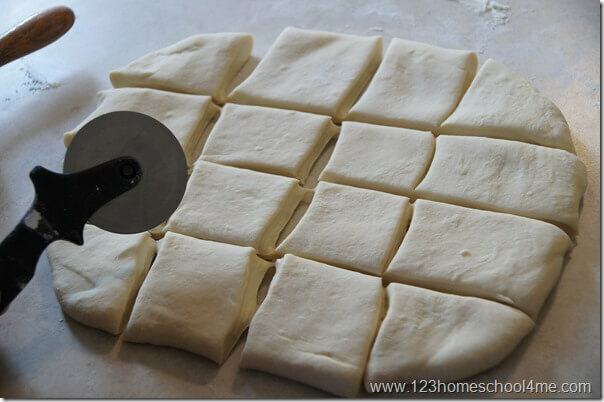 Roll out dough into a square on a floured surface. Using a pizza cutter make 4 rows by 4 rows; 16 rolls. Take the smallest roll and distribute it between other smaller rolls. 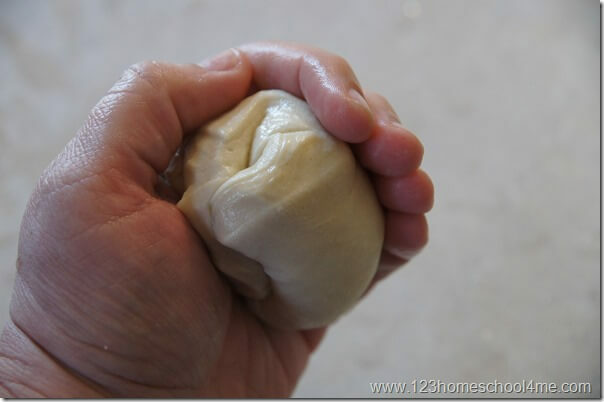 Using wet hands take each section, shape into ball and place in buttered pan. Place in preheated 180 F oven and turn off the oven; do not open door while they are rising the next 30 minutes. 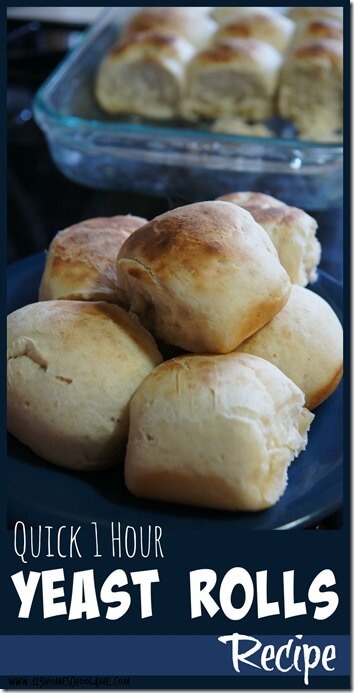 Remove rolls from oven and turn up to 375 F. Bake rolls for 12-15 minutes.